I can understand why a project involving both sharks and twitter caught the media’s eye… and why about a billion of you e-mailed or tweeted the news to me. However, these aren’t the first sharks to be on twitter! There is a website floating around the interwebs entitled “So you want to be a marine biologist?” that most future marine biologists who came of age in the early 21st century have encountered. The sage page of advice is followed up with “So you want to be a marine biologist, the revenge“. Reading through these two essays, one might come to the conclusion that their author, Dr. Milton Love of the University of California, Santa Barbara, should compose a voluminous tome to the fishes of the Pacific coast. Which is exactly what he’s done. Welcome to Certainly More Than You Want to Know About The Fishes of The Pacific Coast: a postmodern experience. Despite it’s self-aware title, this book is far more than just an exhaustive guide to the fishes of the Pacific, though it certainly is that. The highly detailed taxonomic descriptions are rich with humor and insight into the ecology, behavior, and physiology of, if not each species, than each genus or species complex. Interspersed among the taxa are descriptions of prominent Pacific researchers, anecdotes from a lifetime of work on the water, stories by people who lived, worked, and fished these species, and the occasional poem, song, or limerick. Somehow, these disparate units manage to complement each other in a way that makes you want to read what is essential a taxonomy textbook cover-to-cover. The shark blog-o-sphere has been busy lately. Here are some of the headlines from the world of shark science and conservation. Chuck from Ya Like Dags has a fantastic post explaining the ecology of fear and how it relates to sharks. As it turns out, predators can have a major impact on an ecosystem just by being there- prey change their behavior in ecologically significant ways because they want to avoid being eaten. If you’re looking for scientific reasons why sharks are important to the ocean or if you’re just looking for a cool ecology story, check it out! Al Dove of the Georgia Aquarium explains that whale sharks are curious animals that will sometimes swim over to check out humans. I’ve found that most sharks tend to avoid people, but he has a pretty convincing video. National Geographic’s Great Migrations, a seven part series which premieres November 7th, calls itself a collection of “the most moving stories on Earth”. It focuses on some amazing animals from around the world and the incredible journeys they take to survive. This series was a massive undertaking, with the National Geographic crew spending 2 years traveling more than 420,000 miles over 20 countries. The end result is visually spectacular, full of fascinating science and rich in never-before-told stories of animal behavior. The series itself is an great educational resource, and the website has plenty to offer teachers (particularly the Science page and the Teacher Resources page). While many of the best-known migrations involve land animals or birds, some marine migrations are also pretty darn great. Following the deaths of two whale sharks in 2007, many animal rights activists harshly criticized the Georgia Aquarium for keeping these animals captive in the first place. 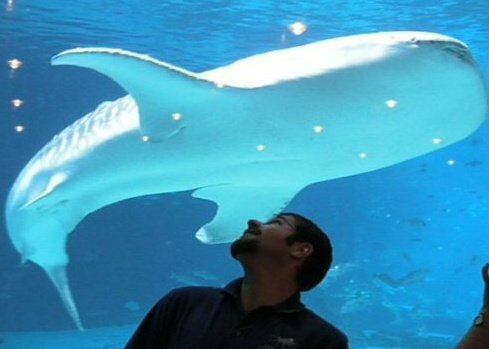 I recently visited the Georgia Aquarium for blogger day, and the aquarium’s Chief Science Officer Dr. Bruce Carlson agreed to answer my questions about their whale sharks. I know that many of you have strong opinions about shark issues, but I wanted to provide the Georgia Aquarium’s side of the story.